Over the last few years, exercise bikes have increasingly diverged in style, features, and the kind of exercise benefits they offer. This is the single most critical choice you'll make when deciding which exercise bike to get, so today, we're going to highlight the features of upright vs. recumbent vs. spin bikes before showing you an example of each type. Now that we've covered the three major types of indoor exercise bikes, let's take a look at one model of each type. The Schwinn 130 is one of the best upright bikes currently on the market, especially when you compare the number of features to its attractively low price point. The Schwinn 130 usually retails for around $330. Assembly is required and will run you another $100 or so, though it's easy enough to do it yourself if you want to. Additional warranties are available (for around $45-$55, depending on the length of time you want to cover the bike). Taken together, the Schwinn 130 is a good example of what an upright exercise bike should be. Aside from the major features, there are a few other points you should consider. First, the bike mount on this model is a standard style, which means you can replace the seat with just about any other bike seat you want. If you have one on an actual bike you want to use, making the change is easy - and similarly, if the default seat isn't comfortable enough, you can swap it. If you're not having professionals assemble the bike, expect to spend 30-90 minutes putting it together, depending on your level of skill. To get the most out of this bike, though, you're going to need a USB drive to plug into it. This is because the manufacturer offers a service known as SchwinnConnect, allowing you to track your weekly, monthly, and yearly progress towards your fitness goals. It is possible to use the bike without a fitness plan, but that's not the best way to use any exercise machine. If you're not sure what exercise bike to get, the Schwinn 130 is an excellent place to start looking. It's affordable, it comes with a variety of helpful features, and it's small enough to fit almost anywhere (including in front of the television, if you'd like to focus on something besides your workout). If you don't need the benefits of either of the models below, you're not going to go wrong with this unit. Schwinn is an excellent manufacturer, and that's why they're on this list more than once. The 270 is a recumbent model, and it's not merely a 130 with a chair. Officially, the Schwinn 270 retails for about $500, but it's common to see a discount down to $400. A mat to put the bike on will run you about $50 more, while expert assembly will be about $100. Additional protection plans may be available. The 270 is to recumbent bikes what the 130 is to uprights - sturdy and capable, with a surprisingly low price for the number and variety of features offered. Sitting on a recumbent unit is a very different experience from riding an upright bike, and you have the choice of sitting back for comfort or leaning forward to maximize the value of your exercise. Setup time is much like the 130, ranging from 30 minutes (for experienced people) to 90 minutes (for those not familiar with assembling bikes). If there's one major downside to this bike, it's the footprint. Recumbent bikes, in general, tend to be large, and the 270 is no exception. This can make it harder to fit into a small home or in front of televisions. Similarly, with this bike coming in at just over 100 pounds, it's not easy to simply move it back and forth when you're not using it. If you set this bike up somewhere, it's probably going to stay there, so you'll need to make sure you can fit it into your house before you buy it. If you'd like to read our in-depth review, click here. Large size aside - and really, that's unavoidable with recumbents - this is an excellent exercise bike if you're looking for something of decent quality and comfort. On average, this unit is about $70 more than the upright 130 but offers enough additional comfort and features to be worth the difference. If you want to be comfortable while still getting good exercise in, this is the best of the three options shown here. This solid indoor unit offers everything you need to start spinning at an affordable price. This unit officially retails for about $300, but can usually be found discounted to around $230. That makes it the most affordable of the three bikes shown here - but remember, spinners are about intensive workouts and aren't necessarily suitable for everyone. Like the other models shown here, professional assembly will cost you another $100 or so, and additional warranties may be available. Given the short warranty for most parts and components, it may be worth getting the added protection. The most notable thing about this bike may not be its features, but the people who buy it. This is a bike that's been repeatedly purchased by gyms looking to set up spinner classes, and in part that's because they trust it to be strong enough to withstand constant, heavy use with minimal maintenance. Of course, this unit is priced so low for a reason - unlike the other models, it doesn't have electronic displays or added functionality. It's a bike, pure and simple, with nothing more complicated than a few basic controls to help adjust your ride. This is the ideal bike if you're looking for short-term, intensive workouts. The relatively small footprint means it's easy to set this bike up in a convenient location, while the wheels make it easier to move the unit when you don't want it out. It's not nearly as comfortable as the 270, but it will certainly get the job done. That said, you may want to add a drink holder, or at least place it somewhere you can have easy access to water. It doesn't come with a holder, and for the intensity of workouts involved, it probably should have. Upright bikes are often said to be the closest to actual bicycles. Like standard bikes, they stand up, have a saddle to sit on, and feel much like you're riding outside. In fact, the feel is so similar than many biking enthusiasts look at getting an upright bike just for that. Given the same overall design, upright bikes tend to offer the same kind of benefits (especially for the lower body) that riding a regular bike offers. The one big difference is how many features and options an upright bike will provide. Upright bikes tend to have fewer options when compared to many other exercise bikes, though you'll usually find choices like resistance adjustment and odometers. Better models may offer pre-programmed 'courses' that change resistance over time. There are two other significant benefits to these models. First, most upright bikes can be folded and stored away. This is ideal if you don't have much space in your house and can't quite afford to set up a permanent exercise station. Second, upright bikes tend to be more affordable than other exercise bikes, so they're often the highest-selling models. Upright bikes are excellent as introductory units. They provide much of the same feel and health benefits as riding a real bike, and at a competitive price no less, which makes them a comfortable starting point. If you're not sure what type of bike to buy, get an exercise bike. There's nothing inherently bad about these - but they do tend to lack the features of other models. Recumbent exercise bikes offer additional back support to riders. Unlike upright models, they aren't even trying to replicate the feel of riding a bike - rather, recumbent bikes are more like sitting in a chair and having pedals in front of you. There are some distinct advantages to this, including better blood flow, significantly increased comfort, and support for people who may have trouble on an upright model. These models also have a lower impact on the body than upright bikes, which reduces the pressure on joints. On a more casual level, recumbent bikes make it much easier to engage in other activities (such as using a tablet or reading a book) while biking, though this does somewhat reduce the effectiveness of any given workout. ​As a general rule, recumbent bikes tend to be more expensive than upright bikes. This doesn't mean most of them are truly expensive, but it is something to keep in mind when budgeting for an exercise bike. 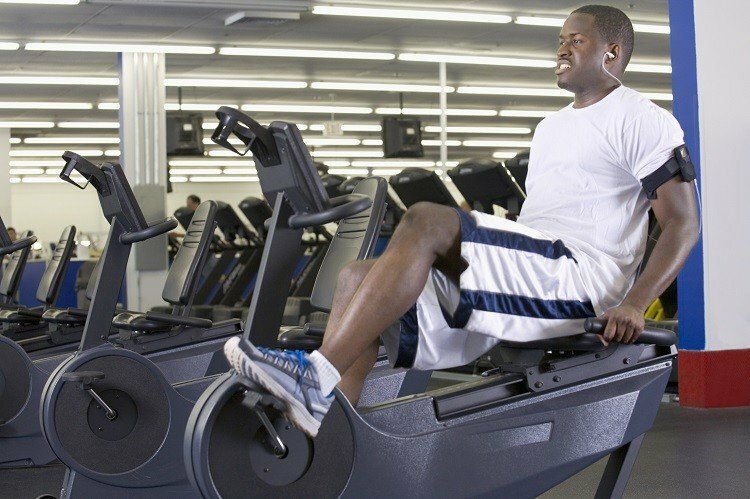 Recumbent exercise bikes are good for low-impact workouts, as well as those where you may need to be doing other things at the same time. Note that low-impact is not the same thing as a bad workout - it just means that there isn't as much pressure on your body. As a comparison, swimming offers almost no impact at all, yet it's an outstanding full-body workout even if you're just walking end-to-end. Sometimes known as "indoor cycling bikes" or "spinners," spin bikes are broadly similar to upright bikes at first glance. Both of them use a saddle, have the rider crouch forward, and allow the user to adjust the bike's resistance to customize the workout. The most significant difference between them is that spin bikes allow you to pedal while standing. This is a significantly more intense workout - and it works different muscle groups as well, allowing you to get a more complete workout. Most spin bikes are meant to simulate climbing a hill, and the constant battle to overcome gravity can provide a more intense workout in a shorter period. Spin bikes tend to be less expensive than upright bikes, but shouldn't be bought based on price. They are intended for different situations, and that should be your primary consideration when deciding between them. Spin bikes are ideal for people who want fast, intensive workouts. If you're not planning to use the bike in this way, you should probably get an upright or a recumbent bike instead. Be sure to check out our Best Spin Bikes guide. You now know the differences between these three types of bikes, and you've seen the different features that a good model of each may have. If you want comfort, get a recumbent bike. If you want the best exercise, get a spinner bike. If you're not sure, or you just want a good balance, get an upright bike. A good exercise bike should last you several years of frequent use at minimum, so don't worry about a few dollars difference in price. Instead, focus on getting the best bike for your body and fitness goals.